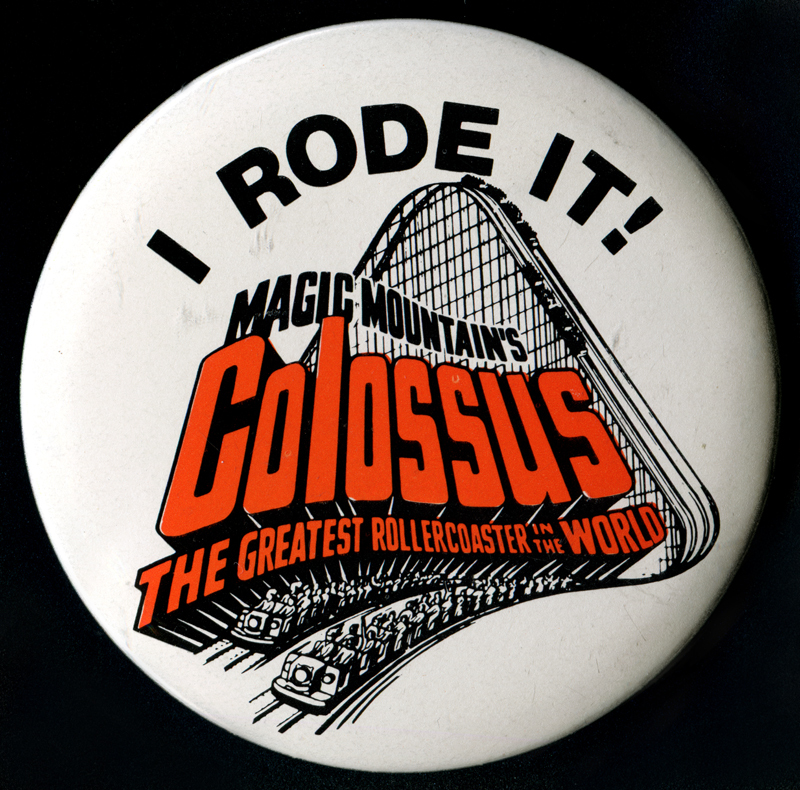 Three-inch pinback: "I Rode It! Magic Mountain's Colossus / The Greatest Rollercoaster in the World," from the coaster's opening year, 1978. Original price tag on the back shows it sold for 47 cents. Rim inscription: ©Best Seal Corp., New York 10013 / 1978. Colossus was one of the tallest and fastest wooden roller coasters in the world when it opened June 29, 1978. Designed by Santa Clarita Valley resident Doug Bernards of Bernards Bros. Construction, it was the world's first coaster to feature two drops in excess of 100 feet (a first drop of 115 feet followed by another drop of 105 feet). Built by International Amusement Devices Inc., the custom, two-track coaster took park visitors on a 2.5-minute ride and reached speeds up to 62 mph. A total of six trains with six cars each, made by Philadelphia Toboggan Coasters, were modified following an opening-year fatality that occurred when an obese woman wasn't properly harnessed. In 1988 the original trains were replaced by faster models from D. H. Morgan Manufacturing. In May 1978, Colossus wasn't quite completed when it provided the backdrop for the NBC television movie, "KISS Meets the Phantom of the Park." In 1983 the coaster was christened the Screemy Meemy for the feature film, "National Lampoon's Vacation," starring Chevy Chase. Colossus was The Newhall Land and Farming Co.'s final foray into theme park history. In 1979, Newhall Land sold Magic Mountain to Six Flags Corp. for $51 million — a profit of just $250,000, the equivalent of three or four of the land company's new homes in Valencia.